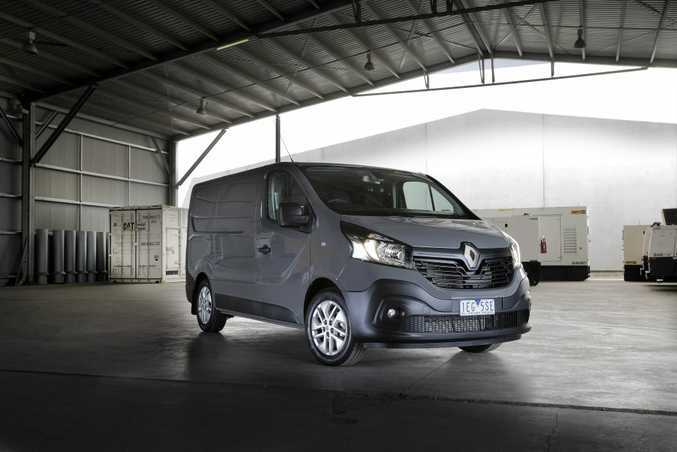 SENSIBLE CHOICE: Renault Trafic is a manual-only 103kW/340Nm diesel with seating for three and a payload of 1237kg. PULLING into our driveway, the anticipation had reached fever-pitch. Luxurious and prestige cars often grace our concrete, but it wasn't something plush and quick which had the kids in raptures: it was the Renault Trafic. Something about a van evokes a world of opportunity. So many things to do, so many places to go, all with a range of goods and chattels, perhaps even the kitchen sink, in tow. The Trafic isn't designed to have you ensconced in the lap of luxury, it's more your tool of trade. Although its on-road etiquette showed the workman-like qualities are confined to the load area. Borrowing plenty of styling cues from the car market, the Trafic has an airy cabin littered with storage spots and tools which help it live up to the mobile office expectation. Three adults can fit across the bench seat with excellent head and leg room - although the middle passenger does have to sit slightly skewed to avoid the gear shifter intrusion around the knees. Although, just like the passenger car range, there are some quirks. The steering wheel buttons are not backlit, which makes it difficult to use the cruise control at night if you're not "au fait" with their operation. Then there is the stereo controls hidden behind the steering wheel. They need to be analysed before you take off for easier toggling between inputs and volume controls. Yet most of the dials and operations are simple, crisp and well labelled, and one advantage the Trafic has over its car counterparts is the cruise control switch located on the dash rather than hidden on the console.The vital missing component is internal grab rails for easier entry and exit… climbing inside does take some effort as the Trafic has a reasonable ride height. The Trafic is remarkably easy to drive. Bolstered by the twin-turbo four-cylinder it feels far stronger than the standalone figures would dictate. Cruise along the highway at 100kmh while ticking over 2000rpm and the benefits of having a six-speed manual are experienced via frugal fuel consumption. Maintain revs around 1500pm and there is discerning power at the ready. Swift shifting of the cogs is needed when climbing and fully laden, and while our cargo didn't get close to the 1200kg payload we never struggled to maintain the legal speed limit. 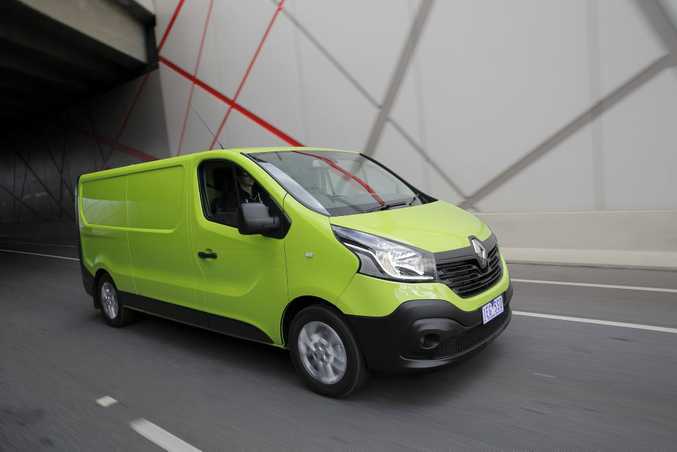 RENAULT TRAFIC: It's French, so it comes in mad colour options too. Steering feels well-weighted; the 11m turning circle is excellent for such a large vehicle. For those used to driving cars, you do need to be mindful of the vehicle's length and you need to provide some extra turn-in space at tight corners to avoid chopping the wheels. Large side mirrors are vital in traffic and while reversing, where the rear parking sensors and camera are vital guidance assistants. 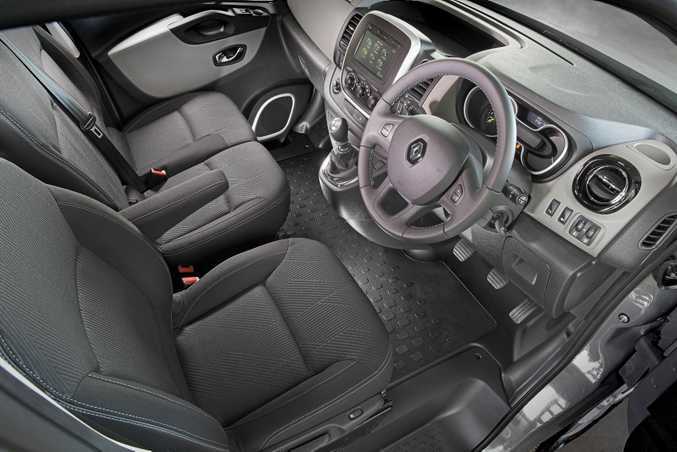 Your standard Trafic comes with air-con, cruise control, leather-wrapped steering wheel, rear parking sensors and reversing camera, automatic lights, CD stereo with full Bluetooth connectivity along with USB and auxiliary ports, as well as daytime running lights. Our test vehicle had the $1990 Premium Pack which we would recommend as good value, as it includes the slick 17.7cm colour screen multimedia system with sat nav, 17-inch alloys, upgraded cloth upholstery, heated seats and other interior upgrades. Safety incorporates anti-lock brakes, stability control that is adaptable depending on the load, driver and passenger front airbags, hill start assist, "extended grip" for better traction on difficult surfaces and anti-roll over protection. 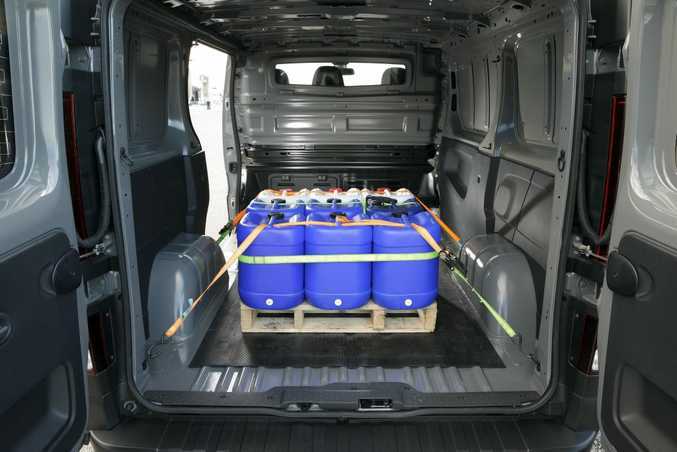 LOAD SPACE: Trafic has a payload of 1237kg and a towing capacity of 2000kg (braked). 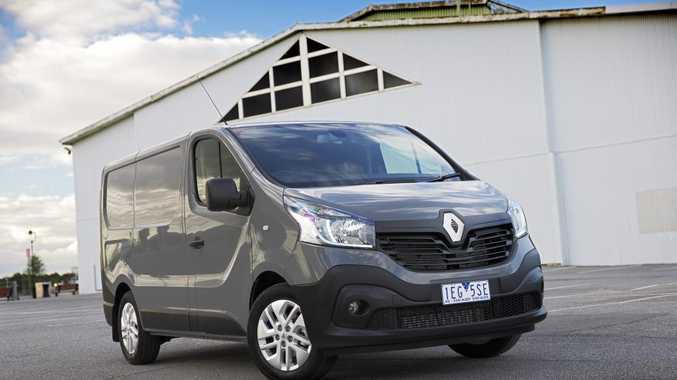 Also worth a look are the Ford Transit FWD ($37,490), Mercedes-Benz Vito 111CDI LWB ($37,140), Volkswagen Transport SWB ($38,690) and Toyota Hiace LWB ($35,990). Getting pretty close to the official figure of 6.2 litres for every 100km, we travelled more than 800km with ample juice remaining. Renault helps sweeten the ownership deal with capped price servicing and improving access to spare parts. There are some excellent storage spaces throughout the cabin. A large area above the dash, an excellent phone holder, three dash cup holders and a fold down centre seat workstation including a detachable A4 clipboard, laptop storage and under-seat bins are brilliant innovations. In the back you get 5sqm of space, 16 anchorage points, steel bulkhead and two coat hooks. Our load of 10 computers and monitors, plus baggage and a bike was easily accommodated with ample space remaining. DIESEL POWER: Trafic returns a combined figure of 6.2-litres for every 100km travelled. Well, it's a van. Hardly catwalk territory, but it does come in a groovy green, or and array of greys for the less adventurous. 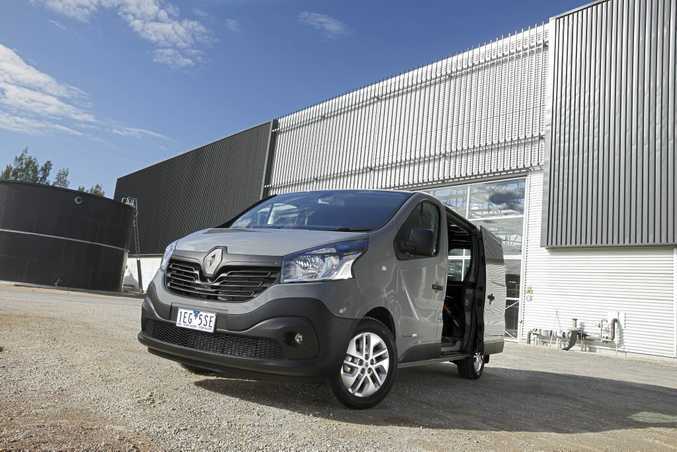 Surprisingly easy to drive and with a host of smart internal functions, the Trafic is a useful tool of the trade. The absence of an automatic transmission may be a disappointment for some, although any man in the industry wouldn't have anything but a manual. What we liked: Gutsy diesel performance, nimble and almost car-like to drive. What we'd like to see: Grab handles to make it easier for entry and exit, automatic transmission option. Warranty and servicing: Three-year/200,000km with 24-hour roadside assistance. Servicing is annual or every 30,000km. First three scheduled services are $349 each. Details: Three-seat short wheelbase front-wheel drive van. Engine: 1.6-litre four-cylinder common rail twin turbo diesel generating maximum power of 103kW @ 35000rpm and peak torque of 340Nm @1500rpm. Performance: 0-100kmh in 10.8 seconds, top speed 181kmh. Bottom line plus on-roads: $36,990 (as tested with optional $1990 Premium Pack).